A scene from the morning of June 27, 2013, when a fire broke out at the Baker Arboretum in Bowling Green. The estate manager of the Baker Arboretum in Bowling Green says more will be known within the next two weeks about paintings damaged during a recent fire. The fire broke out the morning of June 27 in the building housing the world’s largest collection of paintings by the late artist and Hart County native Joe Downing. Estate manager Craig Cunningham told WKU Public Radio Tuesday that a group of art restoration experts from different parts of the country will arrive within the next two weeks to assess what can be done to salvage paintings that suffered smoke and water damage. Nobody was injured during the fire. Estate employees raced into the burning building to rescue the paintings from the flames. Art lovers across the region are holding their breath and hoping that paintings damaged in a Bowling Green fire can be salvaged. 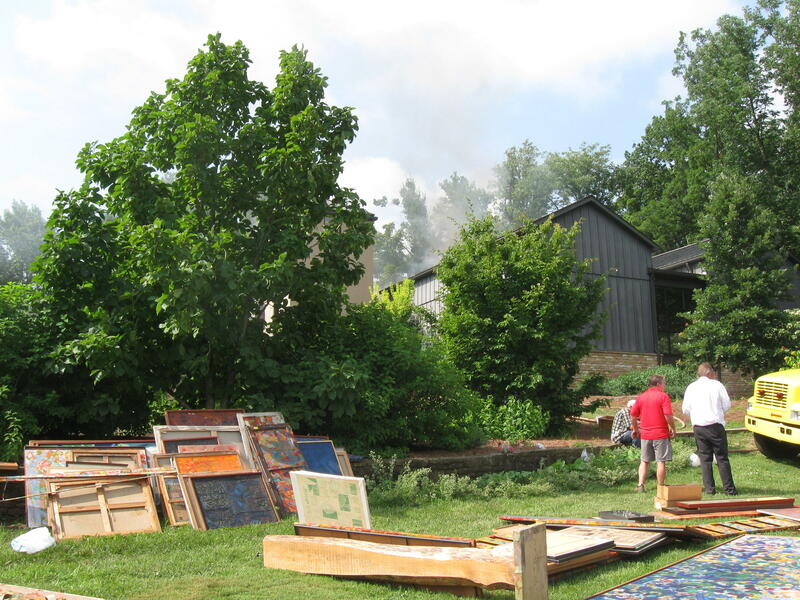 The fire Thursday morning at the Downing Museum at Baker Arboretum led to the evacuation of the world's largest collection of paintings by the late artist and Hart County native Joe Downing. Art restoration experts will now have to inspect the damaged paintings and recommend what, if anything, can be done to save the pieces that were damaged. WKU President Gary Ransdell says the fact that over 90 percent of the art in the building was removed before it was damaged is a testament to the staff members on the scene. "They were actually going into a building that was on fire to get artwork out. It was pretty amazing to see multiple staffs, including WKU staff, coming together to avoid what could have been a tragic, tragic, situation," said Dr. Ransdell." The WKU President says the Downing Museum art is now being housed at the school's campus. "All of the artwork has now been transported to the Kentucky Building, and is in storage and is protected. The art that has been damaged by smoke and water is over in the services supply building where the art restoration experts will look them over and determine what needs to be done immediately, and what needs to take place over time. Efforts are underway to determine what can be done to salvage artwork damaged by the Thursday morning fire at Bowling Green's Downing Museum at the Baker Arboretum. The museum houses numerous paintings by the late artist and Hart County native Joe Downing. WKU President Gary Ransdell says the Downing Museum art is now at different parts of the school's campus. "All of the artwork has now been transported to the Kentucky Building, and is in storage and is protected," said Dr. Ransdell. "The art that has been damaged by smoke and water is over in the services supply building where the art restoration experts will look them over and determine what needs to be done immediately, and what needs to take place over time. Only a few pieces were damaged by the actual fire--I'm guessing maybe 30 or 40 pieces." The fire started before 7 a.m. and was discovered by estate staff members. The cause of the fire is still under investigation. Officials on the scene of the blaze this morning told WKU Public Radio the fire was likely started by an electrical malfunction or a lightning strike.